Kristol calls Romney's comments "stupid and arrogant," noting that "a good chunk of the 47% who don't pay income taxes are Romney supporters," including seniors, troops, and the poor. "So Romney seems to have contempt not just for the Democrats who oppose him, but for tens of millions who intend to vote for him." Jim Antle of the Daily Caller notes that people don't pay income tax in part because of GOP tax cuts, which Romney has pledged to continue. At Reason, Matt Welch says Romney's statements go "against the very message the Republican Party was trying to sell to the world" of upward mobility and entrepreneurial spirit. Romney's 53/47 comment implies "that income status is a permanent political condition, defrocking all Americans of agency and independent thought." Of course, not everyone is turning on Romney. Erick Erickson at RedState—who's no Romney fan—derides the Standard, posting a laundry list of conservative media posts in Romney's favor. 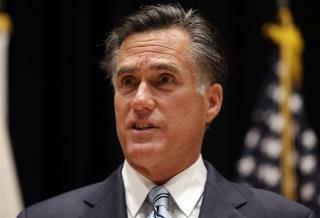 "I'm not going to say it's good for Romney," writes Ed Morrissey of Hot Air. "But if quips won elections, I have dozens more damaging in the Obamateurism series than this." And Rush Limbaugh was positively giddy. "This is such a golden opportunity," he said, according to Politico. "This could be the opportunity for Romney and for that campaign to finally take the gloves off and take the fear off and just start explaining conservatism." Long, long ago, when I was a little boy in Chicago, in the 60s, there was a long-haired Radical. And this Radical, whom I though of as "The Hairy Freak", would stand on the corner of Diversey Avenue, and rant a silly screed about Communism & Capitalism, and he made both sound like freaking cartoons, he was so absurd. And he used to claim that the ultra-wealthy sat around in their private clubs, smoking their big cigars, and bad-mouthing the Poor, calling them lazy, parasites, human cattle & whatnot. I laughed at him, because those ultra-wealthy men were smart, and would obviously realize that their fortunes were based on co-operation between Managers & Workers. Well, Communism turned out to be an utter bust. But DAMMIT! "The Hairy Freak" was RIGHT! Rich men ***do*** talk like cartoons, & abuse & hate the very people whose labor built their fortunes! And I'm sad. Because Mitten's thinks like a cartoon, and thinks I'm one too. We are still waiting for you, Willard Romney, to show us your income taxes for the last 5 years. Prove to the American people that you did not accept amnesty from the IRS for parking money overseas for which you did not claim and did not pay taxes on. You almost feel bad, but the whole thing is just too great of a revelation about him to pass up.